Sorry about the delay in the knit dress photos – I’d planned to do a photoshoot on Sunday but we had a mini hurricane all day, and then I had lung surgery yesterday so even though the dresses are finished (and I’ve started on a third! ), it’ll be a few days until I can climb into them without wincing and make myself presentable. 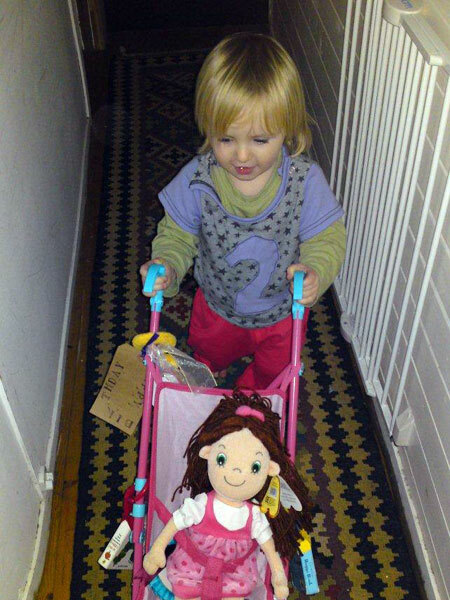 So it’s a good thing that I’ve got these phots of my little neighbour Rosie’s 2nd birthday present to keep you occupied in the meantime, eh? A few weeks ago we were invited to her party and knowing how much she loved Matilda’s dress, I thought I’d make her something to announce the proud occasion. 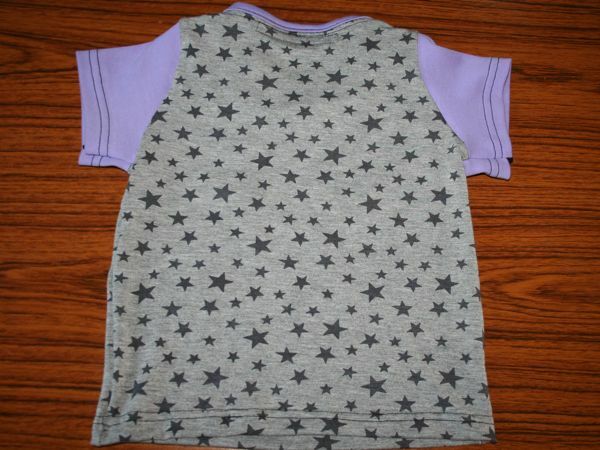 There’s a great amount of toddler patterns in Burda magzines, but I finally settled on BWOF 05/2006 #137 which is just a simple teeshirt with shoulder snaps for easy dressing. 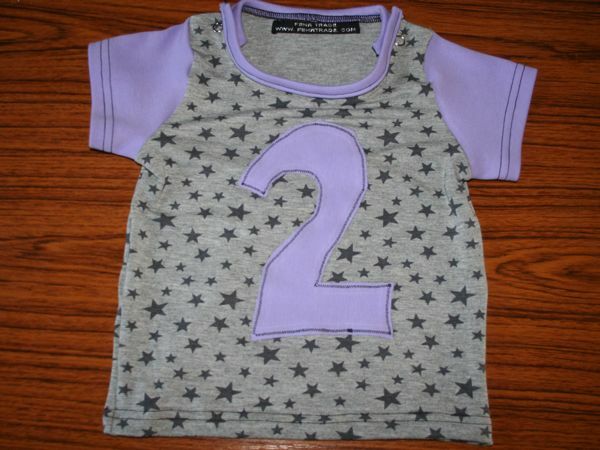 I used some of the ex-Paul Smith grey jersey with stars, bought from Ditto Fabrics, and some lavender cotton interlock leftover from my mom’s dress to make it a little more girlie! I’ve never done these before but they were really easy, and you could definitely add them onto any old pattern by just extending the shoulder seam allowance by an inch or two, attaching the sleeve as usual, then interfacing the seam alowances adding the snaps (apply them to stretchy fabric and they might rip out). I thought this would be a quick and easy project judging from the tech drawing, but it did take longer than I initially thought! First of all, the neckline needed binding, which meant I finally got to use the clear foot with the centre rudder on my coverstitch machine (there’s no way I can justify £80 for a special binding foot!). It made the topstitching on the binding easier, but still not 100% perfect. And here’s the birthday girl herself! When she opened it up and saw the front, she promptly said, “three!”, ha ha! Separator image Posted in Gallery and tagged with bwof, kids, knit.